The First Widely Adopted Copy Machine Came With Which Of These Unusual Accessories? The Xerox 914 was the first commercially successful plain paper copy machine. It not only revolutionized the industry when it was introduced in 1959, but it helped set the stage for our perception of what even constitutes the proper fittings of a large office. The 914 was a hulking copy machine (weighing approximately 650 pounds and measuring 42″ high × 46″ wide × 45″ deep) dominating a corner of the office and ready, at the touch of a button, to duplicate any documents thrown at it (at seven copies per minute). 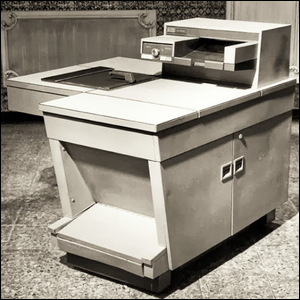 Although Xerox had previous models (the first commercial copier, the Xerox Model A, was introduced by the company when it was known as Haloid way back in 1949), the 914 was the model that put the company (and the process itself) on the map, so to speak. It was fast, easy to use, cheap to operate, and the widespread and rapid adoption of the copier in offices across America ensured that Xerox rapidly became synonymous with copying a document. An office getting a Model 914 was such a big deal that the modern TV series Mad Men, set in the 1960s, paid homage to this with a high profile delivery of a Model 914 to the advertising agency’s office in the premiere episode of Season 2. There was really only one downside to the Model 914. If the paper jammed, it tended to jam near the fuser, and if the machine wasn’t turned off or the jam wasn’t cleared quickly enough, the paper could catch fire. A machine full of paper is about the last thing in an office you want catching fire, and in order to minimize the risk of a machine malfunction causing a serious fire, Xerox included a small fire extinguisher with each model, which they, euphemistically, referred to as a “scorch eliminator”. Despite the design shortcoming, the copier was truly a marvel of its day and companies couldn’t get enough of it. It was a runaway success and accounted for over half of the company’s revenue in the mid-1960s.